On October 5, 2013, 100 en 1 jour (100 in 1 day) took place in Montréal, Canada. 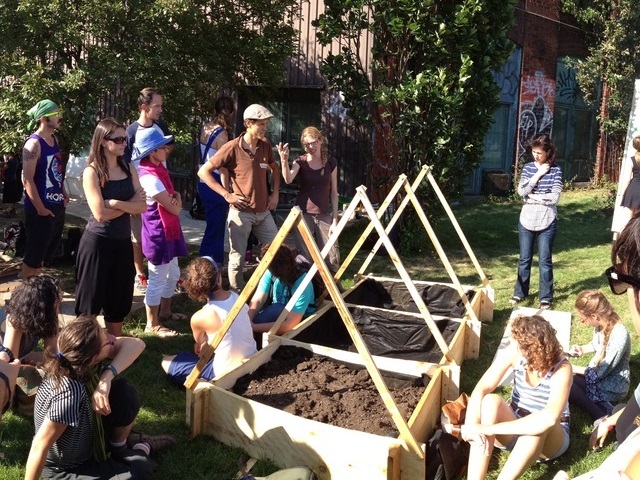 Above, Montréal residents pitch in to build an urban community garden. Photo by Bruno VITASSE/Flickr. From Bogotá, Colombia to Cape Town, South Africa and Kaluga, Russia, the 100 en 1 día (100 in 1 day) movement is making an impact on urban streetscapes worldwide. A “global social movement for citizen-driven change,” the movement is a city-based collective of citizens taking ownership of their cities and making changes in order to improve quality of life. Founded in Bogotá in 2012, 100 in 1 day encourages urban residents to collectively make 100 or more actions – called urban interventions – in 24 hours. These interventions can be any change, big or small, that residents want to see in their city, and by implementing them all at once the movement has the potential to significantly transform cities in just one day. The possibilities for urban interventions that can take place as part of 100 in 1 day are endless. Cape Town’s 100 in 1 day movement describe interventions as “a gift to your city,” and lists examples of possible interventions that include art, music, and drama workshops, yoga and meditation sessions, planting community gardens, and mass bicycle rides. Indeed, many interventions that have already taken place in Bogotá, Montréal, Canada, and other cities have focused on sustainable urban transport and planning projects that help make cities safer, more accessible, and healthier places to live. Standing on its own, one small action to improve a city might not have a significant impact on the lives of urban residents, and it’s easy to be frustrated by the slow pace of improvement that’s so common in many of our world’s cities. The significance of 100 in 1 day is that it harnesses the spirit and action of hundreds of urban residents to scale-up the positive impact of their interventions on quality of life in cities, essentially overnight. With that kind of momentum, who says Rome can’t be built in a day? Let us know what urban intervention you’d like to act on in your city in the comment section! Additionally, find out more about 100 in 1 day by checking out these Flickr photosets or contacting 100en1dia@gmail.com.